Dan, Craig, Mrs. Gettlefinger and family were present to drop the first corn into the pit to load the barge. Everyone associated with this barge has been touched from the seed dealers, to the farmers, the grain graders and lastly to the customer. Todd Armstrong, Agrigold, several farmers, and Debbie Marmon, representing Agrex, Inc. the buyer of the corn were also donors and present Monday. Jim Strickland from Fredricksburg, IN was the first farmer to load food grade quality corn in BIG HOPE 1! Mark Mestemacher, CERES Barge Line speaking on BIG HOPE 1 and how cancer has touched his life. Mary Crowley Cancer Research Centers will receive a percentage of the annual net earnings from BIG HOPE 1 for the first year. Dan McNeil from CGB stating their excitment to be iinvolved in the inaugural loading of BIG HOPE 1. 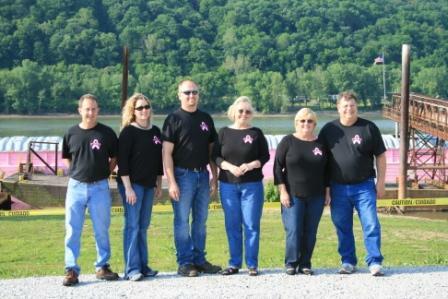 Cancer has touched the lives of almost every CGB employee, and they are happy to join CERES Barge Line, H&B Specialties and others in supporting cancer research. Honoring the memory of Stephen Gettelfinger, farmer from Salem, IN. Stephen has grown corn for H&B Specialties and recently lost his fight with cancer. Left to Right:Todd Armstrong, Agrigold; Robert Rippey, Michael and Jillian, Kelsey, Theresa and Nathaniel Gettelfinger; Dan Heffelmire and Craig Sperry, H&B Specialties, Inc.
Left to Right:Craig Sperry, Stacy Stremsterfer, Kris Neuman, Pat Johnson and Connie & Dan Heffelmire. JEFFERSONVILLE — With the chop of some ropes and a few second slide, a symbol of awareness hit the Ohio River on Thursday afternoon. 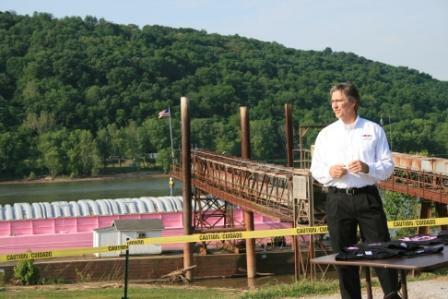 “The color pink is the most recognizable color directly related to the fight to defeat cancer,” said Mark Fletcher, an owner of Ceres Barge Lines. 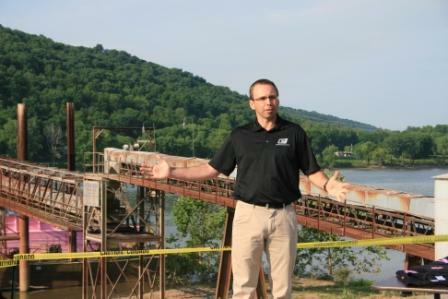 The idea to paint the barge pink, christened the “Big Hope 1,” was an idea of one of the company’s employees, Fletcher said. 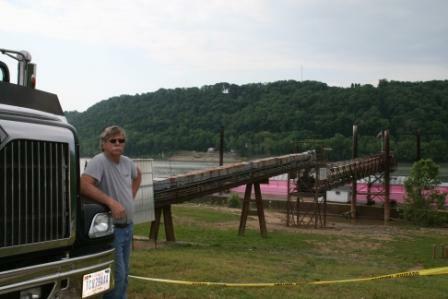 He added that he was initially hesitant to take on the project, but through an agreement by Jeffboat, along with the Sherwin-Williams Co., which donated 200 gallons of the pink paint, the barge was launched. “This is kind of a way we decided to pay it forward and give back something that will hopefully benefit a whole lot of people,” he said. Fletcher and Mark Mestemacher, a co-owner of Ceres Barge Lines, also pledged to donate a percentage of the barge’s net earnings each year to cancer research for at least five years. 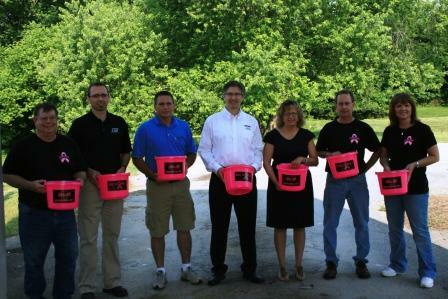 In addition, Jeffboat has raised more than $1,600 to give toward cancer research. Hedgepath was diagnosed with stage two non-Hodgkin’s lymphoma two years ago and is the daughter of a Ceres Barge employee. She along with Charlette Threlkeld, a former New Orleans port director and cancer survivor, and Kristen Nicholson, Jeffboat’s assistant controller and a cancer survivor, were the guests of honor and cut the ropes to launch the barge. But the first and most obvious impression is the barge’s color. “They’re going to know [what it stands for]; no question,” said Michael Eckart, business development manager with Sherwin-Williams.